Playing an integral role to his team’s drive for the playoffs and run to the West Final. His success last season was no accident. 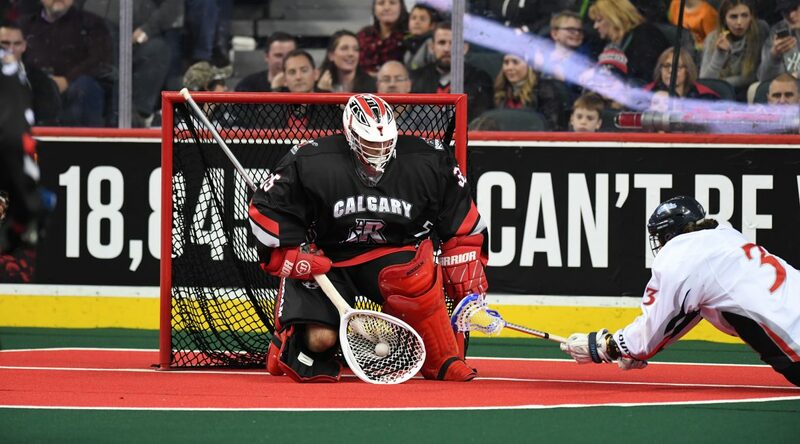 For Roughnecks goaltender Christian Del Bianco, it’s now time to show it. “If you can’t do it twice nobody really cares,” he stated. “I think just proving last year wasn’t a fluke. ‘Some success’ is an understatement for Del Bianco’s breakout 2017-18 season. After getting the start on Feb. 3 against the Toronto Rock at the Scotiabank Saddledome, the then 20-year-old would go on to finish the season with an elite 10.50 goals against average and .793 save percentage. Not bad for a kid with one year left of junior-A eligibility. And taking what he learned from his starting role in the NLL, he finished his junior career in style. He captured his second Minto Cup title with the Coquitlam Adanacs, this time by defeating the Brampton Excelsiors 10-8 in Game 4 Aug. 28 in Calgary to take the best-of-five series. Del Bianco was stellar between the pipes during the tournament, finishing with a 7.43 GAA and .823 SV %. He also took home two individual awards: the Jim McConaghy Memorial Award as the tournament’s most valuable player, and the Jim Bishop Award for leadership, sportsmanship and outstanding play. Given his outstanding play during the NLL season, the focus was certainly on Del Bianco throughout the Minto Cup. For him, though, the victory was always a team effort. “Everybody pulls on the rope,” he explained. “There was a little bit more pressure put on me, not from a teammates standpoint but from an outside standpoint – I think a lot of people tried to make it more about me. Now, it sure would be great to follow that Minto victory with an NLL title. Last year, Del Bianco made it clear he wasn’t easily rattled. Expect more of the same this time around. For Del Bianco, the season can’t start quick enough.